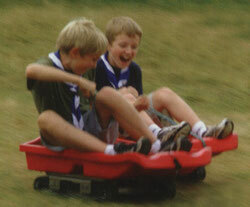 There are loads of fun things that you can do as a Cub Scout. You will get a chance to try lots of different activities like swimming, music, exploring, computing and collecting. If you do them well, you will get a badge which you can wear on your uniform. We always expect our Cubs and Beavers to be on their best behaviour at all times and live up to the promise that they make when they were invested into the pack. By following the cub scout law and remembering our duty to respect others we will all get to enjoy the many fun and diverse activities safely and without damaging our surroundings. Our positive behaviour policy involves using red and yellow cards to indicate when a cub or beaver's behaviour has fallen below what is expected, just like in sport. A yellow card is a warning, a second yellow during a pack meeting or a red card means that member will miss the following meeting. We are extremely proud that have rarely ever needed to issue a card. Some time ago we asked the cubs to devise their own code of conduct, specifically those actions that might merit a red or yellow card.